1882 Indian head penny value is part of the higher priced early years of the 1880s. Condition, one of the key deciding factors, often raises the value much higher. Certain groups of coins are difficult to find in better than average condition. Older coins including 1882 pennies are tough to find nice. 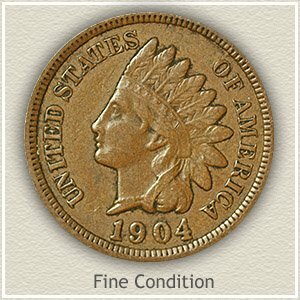 Collectors concerned with quality search through many Indian pennies before an acceptable coin is located. Your coin, if of higher quality, is the exception when considering all the Indian pennies available. Heavily worn is the norm. A detail often lacking is the beaded necklace just above the shoulder line. Detecting individual beads is one indication of less wear and potentially a valuable coin. Condition conscious dealers pay the highest price for "uncirculated" coins. Pictured is an 1882 penny that never entered circulation, a rare situation for coins of the time. Because of exceptional care, preserving it original color and luster, value is greater than $100. Decide on your coin's condition by viewing it under a light and matching it to one of the grading images below. How much an 1882 penny is worth depends greatly on condition. Original luster is a $220 difference in value between the left image and the toned 1882 Indian penny shown on the right. Both are equal in one sense as neither coin entered circulation and no wear is found on each. It is the delicate luster separating the appeal and value of the two coins. Eye appeal of an 1882 Indian penny with brilliant luster places its value far above the toned example. Copper is prone to rapid toning and turning dark shades of tan and then brown. Rarely is an old penny sheltered from the elements allowing it to maintain its bright newly minted shine. Although the bottom coin retains some of the original color in the recesses among the lettering, the other out shines it in value. Both were sold in a David Lawrence rare coin auction and bidders decided on $358 for the bright 1882 and $138 for the evenly toned penny. 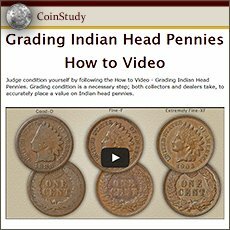 Values of your Indian pennies are stronger for coins with the greater eye appeal. Dark colors have a tendency to hide details, natural lighter colors enhance and highlight the design. Condition of your coin is rated by the different stages of wear and referred to by different "grades." The removing of design details as a coin was used in circulation lowers today's value to a collector. Follow the descriptions and you soon recognize the difference from one "grade" and value to the next. Uncirculated: All the characteristics of a new penny remain. The original mint luster of this old penny is unbroken with no wear to the coin. Toning to a light brown is possible however rotating the coin under a light reveals undisturbed luster underneath. Examine the highest areas for signs of wear. The first to exhibit abrasions is her chin, hair above the eye and curls behind her neck. A coin tops in 1882 Indian head penny value. 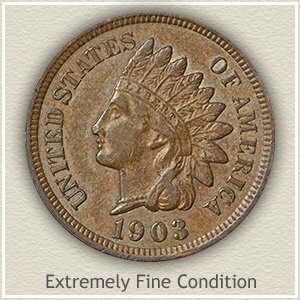 Extremely Fine: Sharply defined details, including the minor elements, describes an Indian penny in "extremely fine" condition. Looking closely at the head band the letters in Liberty are fully separated from the lines of the band. Wear is present, however all parts are bold. Your coin should stand out as very pleasing to the eye and highly detailed. Fine: As a collectible coin, 1882 Indian head penny value is generally double a lesser grade example. Moderate wear with ample detail remaining is the appearance of a "fine" grade penny. Wear has reduced the highest details considerably but not to the point of merging one into the other. The ribbon behind her neck is still separated from the hair, although worn smooth as it crosses. Her forehead is fully detailed and apart from the headband. The headband despite obvious wear still portrays "Liberty." Good: Heavy wear reducing the design to just an outline describes an Indian penny in "good" condition. Normally protected by the line of the shoulder, no evidence of a beaded necklace is visible at the base of the neck. Once finely detailed feather and headband are worn virtually smooth. Although recognizable by date and as an Indian penny, all major elements forming the design have merged. Common dates are now worth one dollar each. You have a popular coin, everyone understands and has heard of the value of an Indian Head penny. Many collectors are building collections and putting a heavy demand on very rare dates and better condition coins. 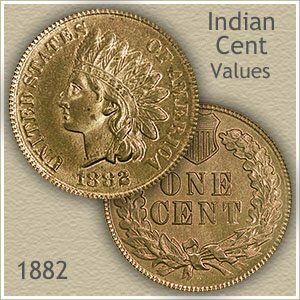 Compare your 1882 Indian head penny value to other dates on the values chart.